Lilo & Stitch is a 2002 American animated adventure science fiction comedy-drama film produced by Walt Disney Feature Animation and released by Walt Disney Pictures. Disney’s 42nd animated feature film, it was written and directed by Dean DeBlois and Chris Sanders (who is the voice of Stitch), and features the voices of Daveigh Chase, Tia Carrere, David Ogden Stiers, Kevin McDonald, Ving Rhames, Jason Scott Lee, and Kevin Michael Richardson. 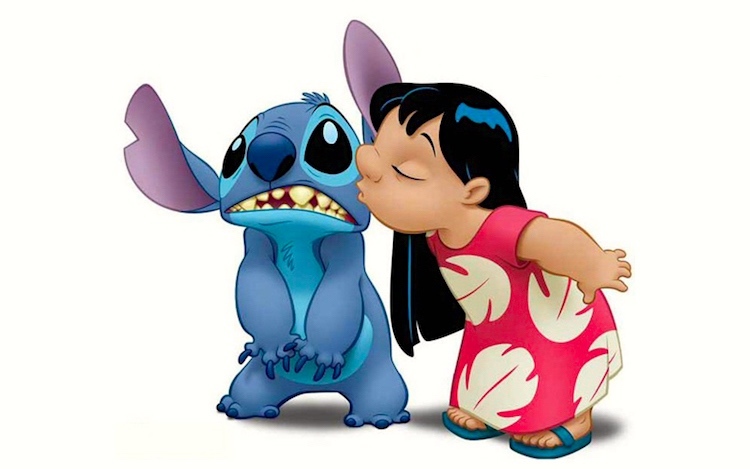 … The film’s story revolves around two eccentric and mischievous individuals: a Hawaiian girl named Lilo Pelekai, who is raised by her sister Nani after their parents died in a car accident, and a blue extraterrestrial creature named Experiment 626 that gets adopted by Lilo as her “dog” and is then given the name “Stitch”. The creature, who is genetically engineered by his scientist creator to cause chaos and destruction, initially uses her family to avoid being captured by an intergalactic federation, but the two individuals develop a close bond through the Hawaiian concept of ˈohana, or extended family. This bond causes him to reconsider, and later defy, his intended destructive purpose in order to keep his family together. We love stories. We tell each other the stories of our lives, in bits and pieces, all the time. We avidly consume stories of other people’s lives, in (auto)biographies, histories, gossip, documentary movies, biopics, sociological studies, reality tv, celebrity magazines, and so on. And we enjoy made-up stories: fairy tales, narrative jokes, fables, comic strips, biblical tales, episodes of tv series (sitcoms, police dramas, westerns, family dramas, monster chronicles, and more), science fiction and fantasy, retellings of myths, novels, epic poems, movies, and so on. The made-up stories are all life stories of one kind or another, and they are also moral stories in one way or another: they show us the courses of real or possible lives, inviting us to participate imaginatively in them; and (sometimes realistically, sometimes metaphorically) they offer us lessons in living: this is a way people might live, learn from that by expanding your range of empathy, or by avoiding this course, or by emulating these characters, or at least by contemplating one or more of these responses. Animated cartoons for children, especially long-form animations, are not only moral stories, they are almost always transparent in offering lessons in living — as Lilo & Stitch is, just read that brief description again. That’s not a criticism; in fact, it’s hard to even imagine an animated cartoon story for children that wasn’t grounded in a moral universe of some kind. Having no point of view, no purpose in telling, would be monstrous. The art comes not from achieving a moral vacuum, but in conveying the complexity of lives through imagery both rich and subtle. The sort of thing that makes, say, My Neighbor Totoro and Coco so enormously satisfying. This entry was posted on March 23, 2019 at 5:17 am and is filed under Language and gender, Linguistics in the comics, Morning names, Movies and tv, Narrative, Narratophilia, Onomatopoeia. You can follow any responses to this entry through the RSS 2.0 feed. You can leave a response, or trackback from your own site.